What do the 4 pictures on all the 책 mean? New Moon- stephenie said she had no choice in her cover art on her website and that she doesn't know what it means. The meaning of tulips is generally perfect love. Like many flowers, different 색깔 of tulips also often carry their own significance. Red tulips are most strongly associated with true love... White tulips are used to claim worthiness 또는 to send a message of forgiveness. Variegated tulips, once among the most 인기 varieties due to their striking color patterns, represent beautiful eyes.A Turkish legend may be responsible for the red tulip's symbolism. The story goes that a prince named Farhad was 사랑 struck 의해 a maiden named Shirin. When Farhad learned that Shirin had been killed, he was so overcome with grief that he killed himself - riding his horse over the edge of a cliff. It's said that a scarlet 튤립 sprang up from each droplet of his blood, giving the red 튤립 the meaning "perfect love." Eclipse- The broken ribbon represents choice, as in the book Bella must choose between her 사랑 for the vampire Edward Cullen, and her friendship/love with the werewolf Jacob Black. Meyer also stated that the ribbon represents the idea that Bella can't break away completely from her human life. Breaking Dawn- Breaking Dawn's cover is a metaphor for Bella's progression throughout the entire saga. She began as the weakest (at least physically, when compared to 뱀파이어 and werewolves) player on the board: the pawn. She ended as the strongest: the queen. In the end, it's Bella that brings about the win for the Cullens. As far as I can tell it's a portrayal of bella, since the book revolves mainly around her. I think that the pawn shows her as her human self, weak, vulnerable, and not as able as other pieces in the sence that the pawn has a very limited range of motion. On the other hand, the 퀸 is the most powerful piece, with the least limited range of motion of any chess piece. I think that this represents bella as a vampire, since she is so strong. Also, the colour seems to back this point up. Bella was always blushing as a human, hence the red pawn, it represents the blood running through her...then, when she becomes a vampire the blood is gone and she becomes as pale as the other vampires, hence the white queen. everyone is saying the picture of the 튤립 with red on it means nothing it is just there for look's, I disagree, if 당신 have read the book even just the first chapter at Bella's party 당신 would get it. It is in that first chapter were the 튤립 with blood on it is. If 당신 have read it then 당신 should know that the reason the Cullens leave is because they dont want Bella to get hurt. The 튤립 with blood on it is when Bella falls and cuts herself and the blood gets all over the 꽃 and Jasper attacks her. So the 튤립 with blood on it is when Bella falls at her party, thats were it came from I think and so do my friends. 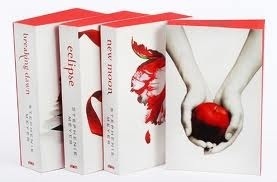 NM when edward leaves it crushs her just like the 튤립 is a "cruppled tulip"
Twilight -- The 사과, 애플 on the cover of Twilight represents the knowledge of good and evil. Eve ate this forbidden 과일 in Genesis, and Twilight has an epigraph from this book of the Bible: "But of the 나무, 트리 of the knowledge of good and evil, thou shalt not eat of it: for in the 일 that thou eatest thereof thou shalt surely die." The 질문 inherent in the 사과, 애플 is "Do 당신 want to know?" It asks if 당신 are going to bite in and discover the frightening possibilities around 당신 또는 refuse and stay 안전한, 안전 in the comfortable world 당신 know. New Moon -- Unlike the other covers, Stephenie was not involved in choosing the cover for New Moon. The author originally proposed a clock image, as time is such a key theme in the book. But ultimately the team that chose the 튤립 focused on the theme of loss. The image of the 꽃 losing its petal was chosen to reflect that. They felt the fallen petal could also be interpreted to represent the drop of blood from Bella's paper cut in the first chapter. Eclipse -- The not-quite-broken ribbon on the cover of Eclipse is a metaphor for Bella trying to leave her human life behind her, but being unable to make a clean break. There are some threads she is unable to cut - she can't completely divorce herself from her past. Breaking Dawn -- The two chess pieces on the cover of Breaking Dawn both represent Bella. They show her moving from the least significant player, the pawn, at the beginning of the Saga to the most important player, the queen, at the end of the series. The chessboard also hints at Breaking Dawn's resolution, where the battle with the Volturi is one of wits and strategy, not physical violence.